In this article, I will be comparing the 5 variations of Preeti Blue Leaf. Namely Preethi Blue Leaf Expert vs Platinum VS Diamond Vs Gold Vs Silver. I will talk about the similarities and difference between these models. Hopeful this should help you buy the right mixer grinder for your kitchen. For someone directly looking for a recommendation, refer to the summary section below. However, I will be getting in more detail further below. When we buy a mixer grinder or any other kitchen appliance for that matter, we look at the overall usefulness of the product and the quality. Keeping both these factors in mind I recommend buying this particular model of Preethi Blue Leaf on Amazon. The same model is also available on Flipkart. You can click here to compare the price on the two platforms. I will get into more specifics of why I choose this model later in the article. So, if you wish to read a detailed review, read on! I will cover only the major points that we need to note while comparing these 5 variations. I will skip a few points that are very obvious and does not add any value while making the purchase decision. p.s. – Don’t worry if you don’t understand the features mentioned on the table completely. I have covered each of them in details further below in the article. Which Preethi Blue Leaf model is the best for me? For most households, Preeti Blue Leaf Platinum is the best option (Check the link above for details). It has all the features that you would need from a regular mixer grinder. It has a powerful motor and enough Jars and blades to do your daily household jobs. 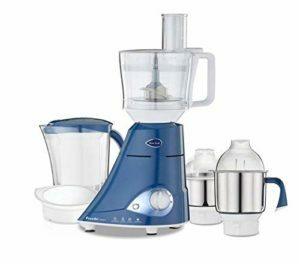 For someone who is looking to buy a food processor to chop vegetables or if you use a machine to knead the dough for roti, you can opt for the upgraded version, Blue Leaf Expert. (Again, use the link in the table above to have a look at the product and for more user reviews. Since the price difference between Gold and Platinum is not very hight, I would recommend spending those extra few hundred rupees and getting more accessories that you get along with the Platinum model. Warranty offered on most of these models is exactly the same, so you don’t have to worry about that aspect too. In this section, I will briefly explain the features that I compared in the comparison table above. This will help you shortlist and buy the product that you need. This is the big jar that you see in the picture on the product page. This jar acts as a multipurpose food processor. It helps you dice, knead atta, chop vegetables etc. You can see the jar in action in the video below. As I said earlier, not everyone needs this jar and hence I recommend saving money by going for the Platinum model. Models with grind and store functionality come with an additional jar like container, which also acts as a lid to your chutney jar. You can use that jar as a lid while grinding your chutney. Once the chutney is made, you can just turn the jar upside down. The chutney then can be easily stored in that container. Sounds confusing? Watch the video below to see this feature in action. Flexi lid, as the name suggests, helps you be flexible with the quantity of material that you can use for grinding in your jar. For example, it can help you convert a 1.5-litre jar in a 1 litre one. This helps you grind your food with more efficiency and speed. This brings me to the end of my article comparing Preethi Blue Leaf Expert vs Platinum VS Diamond Vs Gold Vs Silver. I hope this article helped you select the right mixer grinder for your kitchen needs. So, which one did you opt for? Do let me know in the comments section below.